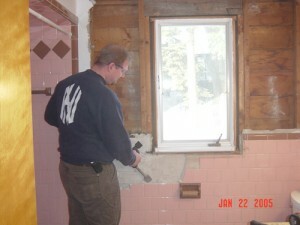 Today I stumbled across a site that made me chuckle and it reminded me of my first bathroom remodeling project. Save The Pink Bathrooms is a site dedicated to the preservation of those “fabulous” mid-century pink bathrooms that existed in millions of homes across this C0untry. If you’re into that style that I urge you to check out their site for some great photos and tips. Even if you’re not a fan of your pink bathroom you may want to consider selling your vintage pink fixtures to a restoration facility. The demand for historically accurate vintage pink fixtures is huge. You’ll also be helping someone build a green building with the recycled fixtures! We had a hard time seeing the beauty of the pink theme including pink tub, pink toilet, pink sink and wall to wall pink tile! So if you’re anything like we are I thought you might enjoy seeing what is possible with some elbow grease and perseverance. We remodeled that bathroom with some beautiful cherry cabinetry, granite countertops and some really great marble tile. As you can see our bathroom remodel was quite extensive. In fact, it was a complete gut job right down to the framing. New Tub with Tiled Shower Enclosure – We tore out the old pink tub and replaced it with a wider, deeper acrylic tub from Kohler. Above that I tiled the shower walls and ceiling with 1/4-inch thick natural marble tiles. New Kohler polished chrome fixtures finished off the tub and shower. New Marble Tile Floors – I installed marble tile floors to match the shower enclosure. Natural marble tile ended up being a great flooring product in the bathroom because it wasn’t super slippery when it was wet. The marble certainly made the bathroom feel like a luxury hotel. New Cherry Cabinets – I installed beautiful cherry cabinets by Thomasville. The his and her vanity also incorporated two unique features that we liked so much we copied in our new home. Between the sinks we installed a cabinet on the countertop with drawers and extra storage space. That cabinet comes in very handy and we’d never build another house without it! The other feature that we incorporated was drawers in the base of the sink cabinets. If you look closely there is a drawer in the bottom of the cabinet. 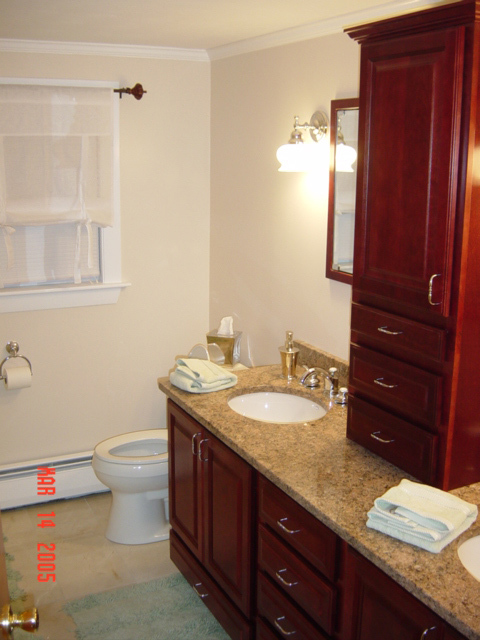 Most sink cabinets do not have a working drawer because of plumbing fixtures. However, you can have most cabinets built with the drawer reversed to bottom of the cabinet as we did. Granite Countertops – The final touch was natural granite countertops. The granite went great with the cherry cabinets and the marble tile and gave the room a very rich feeling. Did You Save Your Pink Bathroom? We ultimately opted to remodel our pink bathroom. However, there’s obviously quite a following and interest in vintage pink bathrooms so think carefully before you swing the sledge hammer! The one bathroom in The Stone House project is pink, but I am not a pink fan. Nor does it go with the period of the house. So we will be remodeling the bathroom. Just can’t take the pink. I approve of the update! The pink and brown tile frightens me! Our pink bathroom went by the wayside, but we did find someone to purchase the pink tile as a part of our effort to recycle 95% of our old house. The purchaser was going to use it to repare tile in her own pink bathroom and for her mosaic art. While we were building our new home, we rented next door for the 18 months of construction….we also had a pink bathroom there. And a seafoam green one! A great post dude. I appreciate the insight. I think that bathroom renovations may be an actual growth area in the future.